An interesting bit of news was just posted over at MomentumVM. Kevin Jorgeson, who has been climbing on the Gritstone of England for the past several weeks, was out climbing recently at the Black Rocks area in Derbyshire. Black Rocks is home to two very famous grit routes in Gaia (E8 6b) and Meshuga (E9 6c). 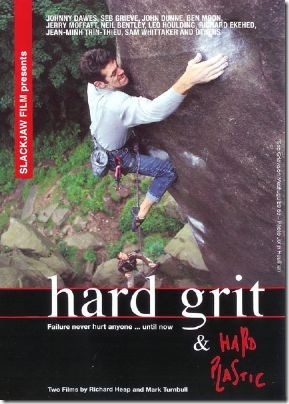 Both routes were featured in the classic film Hard Grit and Lisa Rands is shown climbing Gaia in Dosage 4. Jorgeson apparently decked from the precarious top moves on Gaia while on lead, but he was unharmed thanks in part to a crashpad at the base of the climb. Relatively unfazed by the incident, he tied back in and finished it up. Not wanting to waste the fleetingly good conditions and riding a wave of psych, Jorgeson followed the Gaia ascent up with a solo of the nearby Meshuga. Not bad! According to Kevin’s travel log, Alex Honnold also soloed Meshuga. Not bad either! Nice job to both of them. Gritstone scares me way too much.